Sumana has been trained meticulously by several gurus. Her initial training under Smt. Manjula Mudambi and then Kalashri Smt. 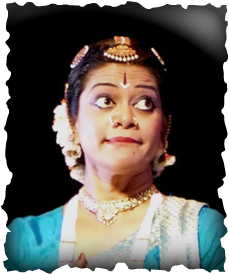 Asha Gopal led to her arangetram (debut) in 1989 in Arizona, as a student of the Pandanallur school of Bharata Natyam. 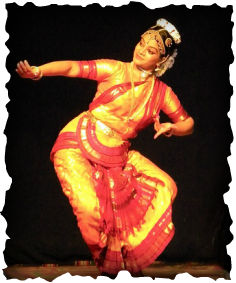 While at the University of Virginia, she was guided by Dr. Aruna Viswadoss in examining Tamil language and literature for dance, while refining her technique in abhinaya. Sumana spent 2 years in Sapporo, Japan, where she had the honor of studying and performing Kagura (Shinto ritual dance) with the Hokkaido Shrine Troupe. As a result, she also conducted several comparative dance workshops there. In 1996, she was able to fulfill her dream of studying under the guidance of Padma Bhushan Dr. Padma Subrahmanyam at Nrithyodaya, Chennai, India, spending 3 years completely immersed in a virtual guru-shishya setting, working to master Bharata Nrityam and the Natyashastra-based pedagogy of imparting Indian classical dance. As part of her training, she also imbibed the Vazhuvoor style of Bharata Natyam and served as research assistant to Dr. Padma and instructor for primary and intermediate classes at Nrithyodaya. Sumana also performed extensively in India with Dr. Padma's troupe, including the Chidambaram Natyanjali Festivals and Doordarshan national TV. She continues to perfect her art with practice, choreography, and further training and collaborations in dance arts. Sumana is currently pursuing a Master of Fine Arts degree in Dance at Arizona State University. Sumana has performed in the USA, Japan, India and England. In Japan, she experimented with incorporating Japanese folktales and stylizations into Indian dance. In India, she toured with Dr. Padma's troupe, performing at the ‘Natyanjali’ festival at Chidambaram, for Doordarshan in New Delhi, and at several sabhas in Chennai, including her maiden performance under Dr. Padma's guidance at Nungambakkam (now Chennai) Cultural Academy in January, 1999. Sumana is an established ambassador for Indian dance and culture, being regularly invited to speak and demonstrate on many occasions. In 2000, Arizona State University’s South Asian Studies Department invited her to talk on “Religion as an Experience of Rasa in Dance”. She presented a Brown Bag Lecture “Beyond Space, Time and Consciousness” and conducted a Teacher In-Service workshop in conjunction with Scottsdale Museum of Contemporary Art’s 2001 exhibit “Wolfgang Laib: A Retrospective”. She was a member of the San Ramon Arts Council, in the Bay Area, from 2004-2005. Sumana was invited to develop an introductory course to Bharata Natyam and teach in residence at the celebrated McCallum High School Fine Arts Academy for the Spring Semester of 2012. There she worked with intermediate level dance students and also served as adjudicator for students' submissions to the National Honor Society for Dance Arts. In March, 2014, Sumana was invited to dance at "Tagore: A Celebration", an event organized by Milwaukee Poet Laureates Jeff Poniewaz and Antler at the Milwaukee Public Library. In Austin, TX, Sumana joined with a group of accomplished and enthusiastic dancers to form Stage Sanchaar, for which she spearheads the production conceptualizations and programming. She continues her work with Stage Sanchaar, keeping in sight the group's mission to promote social awareness and engage in coversation, while supporting non-profit organizations in the communities to which their performances take them. Sumana has experience conducting arangetrams, arranging for orchestral accompaniment, and organizing various workshops for the benefit of her students and the community. Sumana is also an examiner delegated by Dr. Padma to assess students at Nrithyodaya's affiliated schools. In July, 2017, Sumana was invited to give a lecture-demonstration on Bharata Natyam under the auspieces of the Sapporo International Communication Plaza. She also performed as a collaborator for the show "Tsumugu" with Sharadha Dance Studio at Sunpiazza Theater in Sapporo, Japan. In December, 2017, Sumana served as adjudicator for the Arizona Dance Education Organization's Student Choreography Contest.